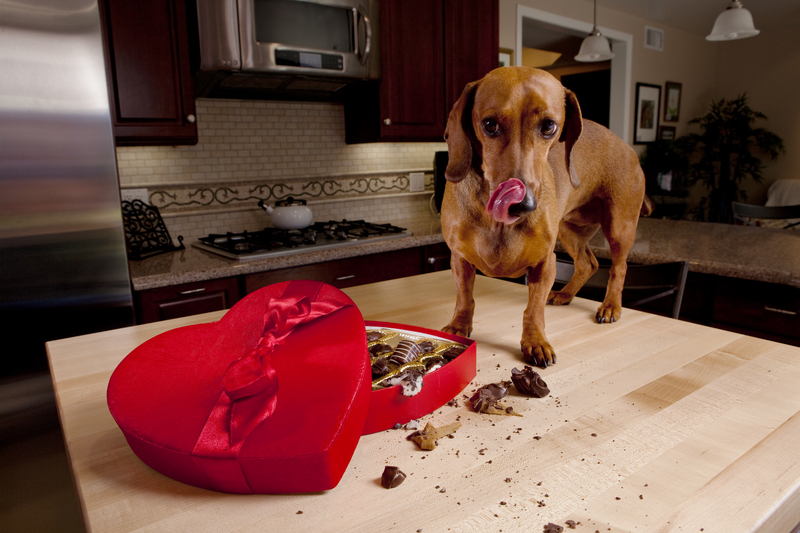 Most pet owners already KNOW that chocolate can be dangerous for dogs. But did your dog just eat (or steal!) a little chocolate from your hidden stock of chocolates? He seems alright when you look at him but is there something you should do about it? Read on to find an answer to a dilemma that most pet owners suffer with after such incidents occur! First let’s quickly understand WHY is chocolate dangerous for dogs. It is no myth that chocolate can be harmful to your pet dog. Chocolate has mainly two components, Caffeine and Theobromine that cause severe reactions in your dog. Some dogs cannot tolerate even the slightest bit of caffeine. The ingestion of caffeine can cause high levels of tachycardia (very fast heart rate) and even result in seizures. Theobromine, an alkaloid, is very toxic to dogs even though it just acts as a diuretic or relaxant in humans. You may have discovered that your dog has been a chocolate bandit by the packaging remnants or crumbs you find on your floor or simply just find your chocolate stash missing entirely! Some dogs show symptoms like extreme thirst, vomiting, diarrhea, muscle rigidity, excessive panting, hyperactive behaviour, pacing and mild to severe seizures. Do you need to run to the Vet if you realise your dog may have ingested some chocolate? If you suspect that your dog has consumed chocolate, you must call your vet right away. Be sure to describe the amount of chocolate your pet ate up, the kind of chocolate (dark, white, 80% cocoa and so on) and most importantly ‘when’ you think the crime was committed by your chocolate bandit. Your Vet may ask you to describe if your dog is having any symptoms and based on their judgement, choose to induce vomiting or administer activated charcoal to get the toxins out of his or her body. My dog looks perfectly fine after eating some chocolate, why is that? Some dogs do not show clinical signs of chocolate toxicity simply because they did not ingest the amount that was high enough to cross the toxic threshold. Please remember that different dogs have different toxic thresholds and this is not something you want to experiment with. Remember that chocolate is harmful for your dog, so irrespective of the amount, you must alert your Vet about the incident and follow their direction. The higher the amount of chocolate that is consumed, the more likely it is that your pet will need treatment. Is white chocolate safer than dark or brown chocolate? Chocolate is chocolate, and chocolate is toxic for dogs. White chocolate contains less theobromine than brown or dark chocolate however it still contains theobromine and since you are not in a position to gauge your pet’s toxic threshold, it is advised that your dog consumes NO chocolate. Does it matter if my dog is Small or Big? The size of your dog plays a role in whether your dog shows symptoms or not. A very small amount of brown chocolate maybe well tolerated by a Great Dane however if your Beagle consumes the same amount, your pet could undergo some serious reactions. Chocolate toxicity is determined by the weight of the dog and the amount of chocolate consumed. It is always a good idea to inform your Vet of any chocolate-gobbling episode irrespective of the size of your dog! Call your Vet immediate if you suspect your dog has ingested any amount of chocolate and let the Vet decide whether your dog should receive treatment or not! There are several other goodies your pet can ENJOY besides Chocolates..don’t ever be tempted to give your pet chocolate just because you’re feeling guilty about having it alone!